I've been selling, trading and saving, so I could buy a brace of 72' Open Tops in .45 Colt caliber. I was finally able to do so. I don't have them in hand yet, they're in transit to my FFL. So once the waiting period is over, I'll get some really good pictures of them and post a shooting report. I'm VERY excited to have these! Those are so purdy, they bring a tear to m'eye. Fantastic score, thanks for sharing! Congrats Dave. they sure look nice. Thanks Fellas. Been wanting these for a very long time. They're going to be my main match pistols for SASS competition. I'm not a fan of Rugers, they just don't feel right in my hands. Not to mention, they don't replicate the original guns. At least not to me. I like SAA's, but my true interest is in the BP era and early cartridge guns. Since I'm pretty proficient with my cap & ball Colts, the 72's should do nicely for me. I've gone down the same route - only for different reasons. 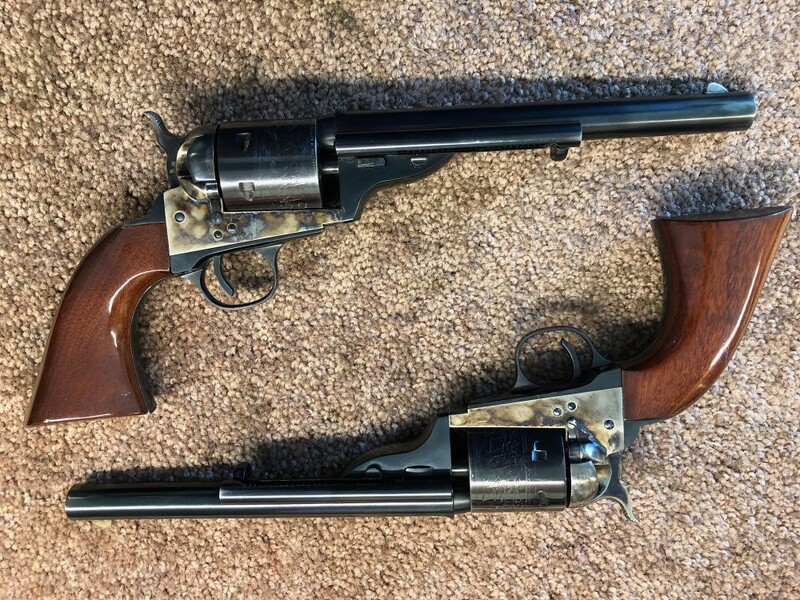 Picked up a pair of Richards-Mason .38s with 5 1/2 inch barrels to replace the 2nd Gen '61 Navies I've been shooting in SASS matches for the last 10 years or so. Having been diagnosed with Parkinson's disease last August, I now know why shooting cap guns was getting to be such a chore. Loading 38s is a lot easier. Hi Dave, those look very nice. 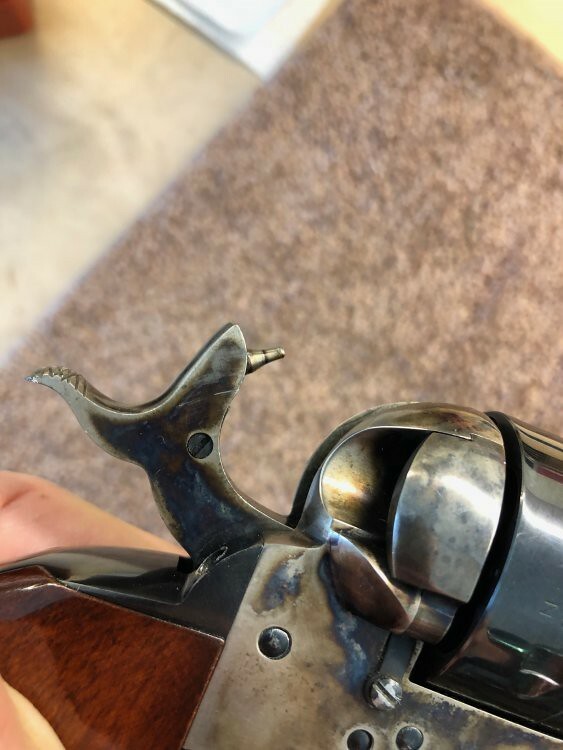 Do those revolvers have the firing pin on the hammer? Look forward to seeing your shooting report. Well dang it Fingers, sorry to hear that. Hopefully the R-M .38's make it so shooting is still enjoyable for you. Thanks Richard. And yes Sir, hammer and firing pin like the originals. Dang it all, Dave...now you're gettin' me droolin' over that open top. You ought not to do that. My immunity is rather low these days. Go for it Capt! You've got a birthday coming up, you deserve it! I think I bought myself that Santa Barbara for my birthday. 'Least, that's what I told myself when I put money down on it. I saw that. Not a bad birthday present either! Did you get your open tops from Taylors, Cimarron, or 'other'? I got them from "other" Capt. I bought them from a guy on the SASS website, but they are Cimarron's. They sure are sweet! .45LC, I would suppose?